This is it. Months after we drove a pre-production model out on a Swedish lake, here now are official images and details on the new BMW M5. The unsurprising news? It looks exactly like the concept shown to a private group two months ago. The semi-surprising news? The twin-turbo V8 engine is putting down a sub-Cadillac CTS-V 552 horses. Hell, the uber-Caddy's even got a good 50 more torques than the new M5. Did an American automaker just beat the Germans at the power war? It seems so. In March, when Chris Harris drove the new F10-platformed M5 for us and EVO magazine, BMW wouldn't yet confirm what tweaks had been made to the X6M/X5M twin-turbo V8, but admitted to different intake and exhaust systems and cryptically stating it would be unlikely to let the M5 have less power than the hot-UVs. 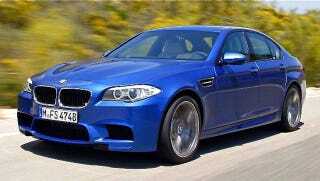 True to form, the new M5 has more than 547 HP. Unfortunately for BMW, it's only a little bit more — 552 HP. While a sizable jump from the previous E60 M5's power output, it's still a few horsies short of the newest badass bomber from across the puddle — the Cadillac CTS-V. But really, the numbers aren't actually what's important here. The real important thing — as far as 'merican fanboys are concerned — is this is the first time a new BMW M5 has launched and a freakin' Cadillac can be considered the reference point on it. That's a shift of Teutonic proportions.